It doesn't matter if you're drastically changing your style (not recommended!) or just keeping things tidy, book in to see your barber a week before your wedding. Giving yourself a solid seven days means your hair can grow back slightly, making it look a little more natural. Booking an early appointment also means you avoid risking an awkward situation if your barber can't squeeze you in the day before. The secret to strong, healthy hair on your wedding day starts with a reliable shampoo and conditioner. Many men neglect these products, but they are essential for balancing sebum oil which causes greasy hair. Every man needs a bespoke regime when it comes to these products as sebum oil is produced at different speeds depending on the lifestyle of the person. For me, a thorough wash with each product on a daily basis works perfectly. 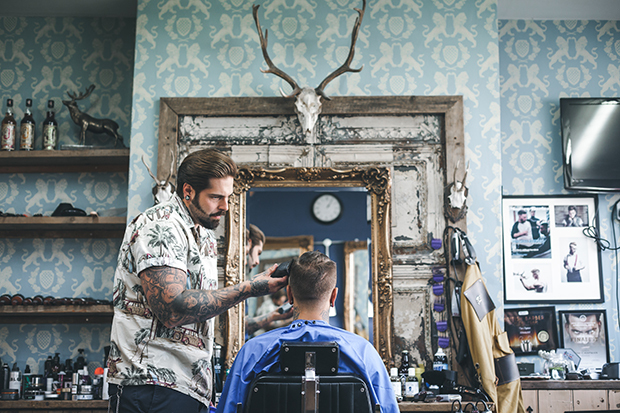 If you're a clean-shaven gentleman, then consider heading down to your barbershop with your groomsmen for a traditional wet shave before your wedding day. The hot towels will do your complexion the world of good, while a traditional cut-throat razor promises a close shave like you've never experienced. Make sure your barber finishes with a post-shave balm to soothe the skin and reduce redness and irritation. No, not down there! While at the barbershop, ask your barber to trim your nose hair, pluck or thread your eyebrows and ask if they do ear singeing. If you're a bearded gentleman, make sure you visit your barber for a trim before the big day. Beards become unruly and messy quickly, so do this the week before the wedding. Use a beard oil as well to soften your facial hair and leave it smelling irresistible. Your skin is your largest organ and needs to be pampered and looked after. Drink plenty of water in the build up to your big day to keep the skin hydrated. It's also worth using a face scrub to remove dirt and oil from deep inside the skin's pores for a complexion that glows with confidence. Lots of men get so caught up thinking about their suit, shoes and tie that they forget to consider the simple things. It takes no time at all to cut and clean your nails, but this will make all the difference when you look back at the photos of you cutting the cake and exchanging rings. The trend for men's hairstyles is for a little longer and softer look, so I recommend using a sea salt spray or volumising powder to create a look that boasts great body and hold without the slick, wet-effect. With natural looks in demand, a textured style also looks better through the photographer's lens. Whether it's sweet or musky, make sure you wear cologne on your wedding day – just don't get carried away! Regulate the number of spritzes to just one or two and dip your finger into the cologne to evenly distribute the scent. Consider the wrists, neck, chest and underarms as hotspots.